We've posted a fair share of fan-made projects taking our favourite video games and characters and giving them a HD graphical overhaul, from the Ocarina of Time's Master Sword cutscene to Bulbasaur, Charmander, and Squirtle frolicking in an open field. These have come from a range of creators, and while sometimes their styles or overall delivery can be questionable, their efforts and talents are by no means taken for granted. With that said, YouTuber CryZENx (who has produced a variety of said projects already) has done it again, but this time focuses on an older title in The Legend of Zelda: A Link to the Past for the Super Nintendo. The video below reenacts the beginning of the game where Link awakens from his slumber to go and look for his uncle. Check out the video below, and if you're a fan, have a look at CryZENx's other work on his YouTube channel. What do you make of seeing such a heritage title being depicted in this way? Would you like to play a HD remake such as what's shown here of ALTTP, or is it better left untouched? Sound-off below! It surely looks cool, but the original seems a lot more playable. Oh look - it's Zelda minus all the nice art direction. Looks great to me. Not only because of all the graphical bling, but also because it actually retains a style suited to the series instead of trying to go all gritty on it. Being fan made, it looks fairly nice. Better than most other ones I've seen. Looks nice, but its not the original. How about he does pulling the Master Sword out as the next one? I'd take it over TP HD, but I like Zelda U better. Though partly I feel like I just watched Donkey Kong run thru that same grass last week so the thrill is gone. It's cool to see a link to the past part in 3d, but the character model and everything looks like crap and really lacks that nice detailing Nintendo adds to their games. Hey, I'd be glad to advertise your own going forward! The atmosphere? Great, very fitting and well done. The lantern? Nice touch. Link? Too wooden and jerky while moving, and his right hand is in a permanent fist. I like to see fan creations like this, but I prefer the Zelda series's unique art direction over anything I've currently seen in UE4. Good job I think its cool when fans express their appreciation of a series . Got bored halfway through because he showed way too much of Link himself. Impressive work, for sure, but the video itself was largely dull because he was moving forward in the scenery at such a slow pace just so he could pan around Link fifty different times. Again, atmosphere was great, but his style of Link was a bad choice. And the lantern threw me off too. I do understand why he had it though. Looks nice, but the guy needs to get caned for the way he used, or rather misused the camera. What's will all the turning round and round? Sjeesh... It truly was the bad version of getting nauseous in a carnival joyride. And the lantern's jerky movement even when Link was standing still was also off key. I like the look of the Link, save the stenotic arm, but it was sad we didn't see any forest or soilders. Also the lantern seemed to be stuck at a permanent 15 degree angle, with the occasional (and for no reason) jerks. It's nice, but as one poster said above the problem with these HD remakes is art direction. It makes everything seem disjointed. @Fee we simply don't toss around those words. So again, please don't. That one actually looks amazing! We definitely need a Zelda game that looks like that and if the rumors of the NX are true then we may at least get close in terms of graphical fidelity! 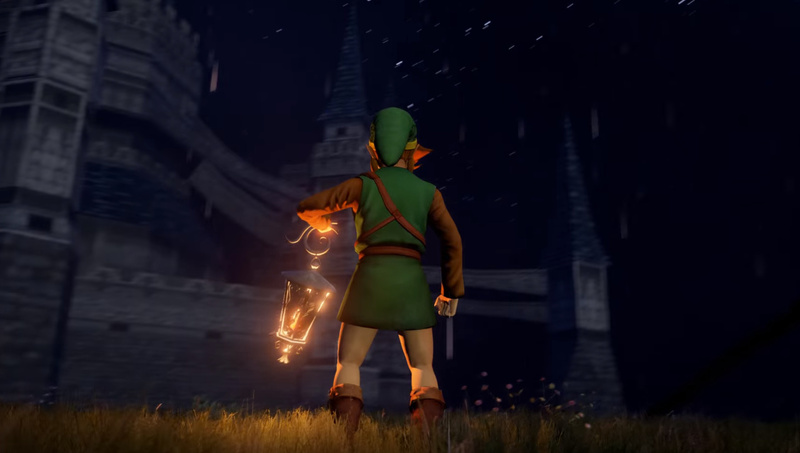 I would buy a Zelda game that looks like that in an instant though admittedly Zelda games are more about gameplay than graphics but I see no reason why we shouldn't be able to have both! My only concern is how long it would take to develop such a game since seeing as Zelda Wii U has taken this long then a game looking like that would take far longer if I had to wager a guess though that is depending on the scope of the game. Now this is what I was talking about when I say impressive. Instead of repainting new textures and pictures to already great 3D action games like Ocarina of Time and Wind Waker, remaking the original A Link to the Past in a 3D perspective style is a game I would definitely look forward too if it ever became legit. @hYdeks I was just looking up Oswald the Rabbit and here I find your avatar. I almost choked when link started running loooooool. Looks really cool though!! Eh. Environment and lighting effects, pretty good (and a part of the engine I assume). The modeling by the guy, his camera placement, character animation, and the lighting (in terms of playability), pretty awful. The environment is mostly good, the bridge, castle, and lightning being my biggest issue. It's okay, decent when still, terrifying in motion. Am I the only one who really wants to play a 3D re-imagining of the first Legend of Zelda on NES? It looks good enough, but Link's movements are seriously goofy and awkward. It reminds me of the puppets from Team America World Police. Amazing work, would be great to see as a real game. We get it, we want Nintendo to use Unreal...not happening. Enough Unreal stuff! 0:14 - shouldn't the hover boots have wings on them? All seen the new nx rumour on mynintendonews? Unreal engine 4 won't be a problem! Nah, 2D games should stay 2D and 3D games should stay 3D. The next HD remaster/remake for Zelda should be Skyward Sword HD. @Kilroy Yep, that was my thought as well. Got bored and stopped the video because I was tired of two steps followed by 1 minute of camera panning. The over-world was too small and too empty...where were the soldiers that block your path? Also the animation (while it looked like it was borrowed from OOT) was too clunky. It was pretty though. @AshFoxX 3d dot heroes on PS3 is pretty much this. Let's take a look at the comments that will most likely pop up in here. 1) People wanting Nintendo to compete in the graphical arms race. 2) People saying Nintendo competing in the graphical arms race would be selling out their true self. 3) People pointing out the mistakes in the video and generally nitpicking. 4) People being sick of Unreal Engine videos. 5) People who will see this as another reason to talk about the NX. And other variations of comments either supporting or opposing Nintendo using either Unreal Engine or generally competitive graphical engines. To prove how most Unreal Engine are the same in their purpose - or rather how their NL coverage always has the same purpose - I will post this exact comment under every Unreal Engine article. @TheRealThanos I noticed the spinning camera as well, but thought he was doing it on purpose to show that this was playable in real time, not pre-rendered (that might be the wrong word, but you know what I mean), and it also showed off the real time lighting from the lantern, which I thought was the best part of the vid. Was a bit nauseating too. Why are stars visible during a heavy night storm? Why don't any modern interpretations of this story-era acknowledge his pink hair? It's all just way too sparse and clinical. I'd simply hate to see or play a redone version of ALttP in this style. @AlexSora89 Spamming this is also rather not great of an idea. I might be wrong, but isn't this just the retro Hyrule Warriors costume (which is actually NES style Link) transplanted into UE4 with Twilight Princess's castle? The rest appears to be generic unreal assets. No worries, I don't think I will spam it... yet. @Ryu_Niiyama i meant OOT style remake of Zelda 1. @CrazyMetroid NL can only post so many of these Unreal videos before the novelty becomes stale. I think we reached that point around the time they shown off Unreal Metroid Prime. @allav866 just because you have to be a debby downer doesn't mean everyone has to cater to your needs. Most find these enjoyable to watch, if you don't, I have a simple solution for you: Don't click on it and don't comment on it. @CrazyMetroid You mean how if you don't find my comment enjoyable to read, ignore it and don't reply to it? @allav866 that way you go on with your negativity over and over? We'll always have the original SNES game around, so why not give it a go? It would be very interesting to see what Nintendo could do in this regard. Nice work. I personally wouldn't mind a 3d version of that awesome Snes game. It might be interesting to play the game that way.